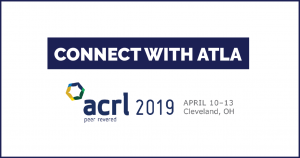 We have several opportunities for you to connect with ATLA staff at the Association of College and Research Libraries (ACRL) 2019 Conference in Cleveland, Ohio. Meet with ATLA staff, network with fellow scholars, and learn about the significant developments with our products and services. Find us at exhibit booth #235 during Exhibit Hall Open hours. Come by to pick up some swag, get questions answered, and learn what’s new with ATLA. Join ATLA and EBSCO for a breakfast presentation on Thursday, April 11, at the Hilton Cleveland Downtown from 7:00 am – 8:00 am. The topic, “Deep Learning, Experimental Humanities, and the Future of the Higher Education — Or, Why Librarians and Humanities Scholars Need to Learn to Code,” will be presented by Dr. Timothy Beal, Florence Harkness Professor of Religion and chair of the Department of Religious Studies at Case Western Reserve University. He has published thirteen books, most recently The Book of Revelation: A Biography (Princeton University Press, 2018), for which he won a Public Scholar Award from the National Endowment for the Humanities. If you attended the 2018 ATLA Annual Conference, you may recognize him as Thursday’s plenary speaker. RSVP and learn more about Thursday’s presentation. You and your colleagues are invited to attend our reception on Thursday, April 11, held at Lola Bistro from 5:00 pm – 6:30 pm. Enjoy an evening of networking with scholars, publishers, and ATLA staff at Cleveland’s crown jewel. Lola is located at 2058 E. 4th Street a short distance from the convention center. RSVP up until the event. Stay tuned for more ways to connect with us at ACRL.